F1 drivers are some of the fittest athletes in the World, which surprises many due to the fact that they spend their lives sitting down. The typical Formula one driver is put through an immense amount of G-Force in every race, with each high speed corner, undulation and chicane causing the drivers body to be put through an immense amount of strain. How do drivers train to cope with this? Well in a billion pound sport where millions are spent to gain even the smallest, fractions of a second edge, it is no surprise that the top drivers and their teams are adopting the latest and greatest in fitness technology. The top drivers were all in action at the Barcelona Grand Prix yesterday, with Fernando Alonso gaining an impressive victory. As Fernando Alonso tackled his home circuit, each turn of his steering wheel delivered up to 24 KG of strain through his arms. The winning time was 1 hour 39 minutes for Alonso, meaning his arms literally had to turn thousands of kilograms over the duration of the race. During the race, each driver will shed 3-4kg of body weight in sweat alone, and will burn up to 2,000 calories. Their neck will have to withstand near fighter jet levels of G-Force, and all of this is taken on in a small, cramped cockpit. Needless to say, Formula one drivers are some of the most impressively fit athletes in the World, and they get there because they have access to some fo the most advanced fitness technology on the market. It is handy that Alonso was the victor in Barcelona, as he and his Ferrari teammate Massa are two of the top racing drivers who are utilising bespoke piece of fitness technology from leading gym manufacturer, Technogym. Technogym’s equipment is fittingly designed to look like a racing car, but don’t let its slightly gimmicky exterior fool you. This is one serious piece of fitness technology, which is designed to simultaneously work the user’s arms, shoulders and neck, from a serious of changing angles. In essence, this is a piece of strength training technology that mimics the forces that the driver’s body is put through during a race. The Technogym F1 training machine utilises varying intensities of vibrations, a concept taken from the super-common vibration machines that you see in your local gym. The steering wheel has a plate loaded resistance, allowing the trainee to load it up with up to 25KG, and it also features two weights stacks, like you find on the more common place Technogym machines (and other weights machines). The trainee wears a race helmet, which can be a heavier version specifically designed to allow the trainee to train harder in practice in order to make the race easier. The helmet connects to a series of cables which deliver additional elastic resistance across multiple angles, in order to properly mimic the type of forces that the driver will encounter across all of the F1 courses. 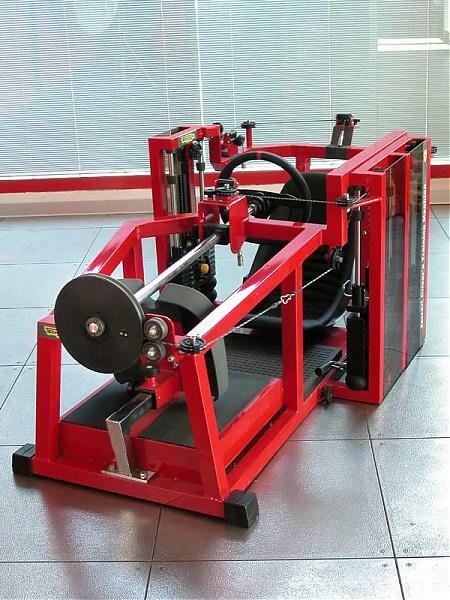 This can be set to deliver quick bursts of heavy resistance, which is designed to replicate the quick acceleration and deceleration which F1 drivers have to cope with. Forearm strength endurance is super critical for F1 drivers, because much of the fatigue that comes from those thousands of steering wheel turns builds up in the weak link. The forearms are the weaker link between the driver’s arms and shoulders, so the Technogym F1 trainer allows the driver to load up to 25KG onto the wheel, in increments of 2.5KG. The machine uses vibration here too, replicating the forces that the driver will experience on race day. 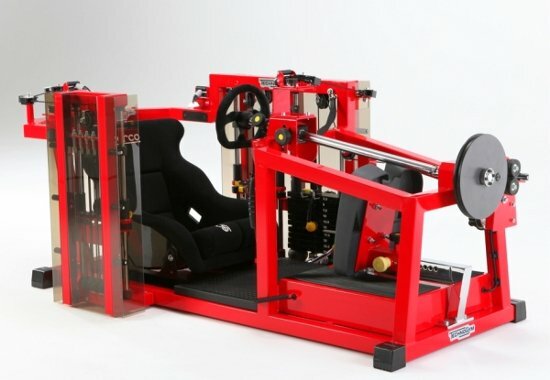 The fast, low F1 cars, with their limited suspension are notoriously vibration heavy, and this is a key training element for the driver. How else do Formula one drivers train? 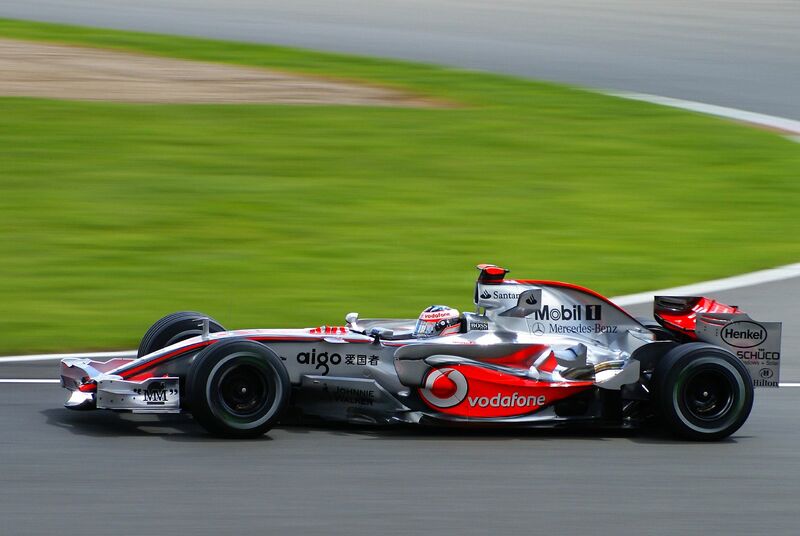 F1 drivers need a full spectrum of fitness, ranging from strength endurance right through to pure endurance. Racing in F1 is like completing a fast paced, 90 minute weights workout in extreme heat. So besides specialised kit like the Technogym F1 trainer, many top tier F1 drivers use concepts found in crossfit, HIIT and fast paced, whole body workouts with very short rest periods. Their performance is monitored closely, and they are trained by highly specialist personal trainers. They use a number of highly advanced heart rate monitors and V02 consumption devices in order to measure their performance over time, and their diet is highly limited during race season. Many leading F1 drivers are keen athletes outside of the sport. Mark Webber from Red Bull is known to spend much of his free time surfing, and Jensen Button is a semi-competitive triathlete. Next article16 stunning tips to save £5,320 a year with fitness tech – save money on fitness!